Infolinks yesterday announced world’s first self-service In-Text ad marketplace. Infolinks one of the most popular In-text ad network where they serve In-text ads, but all those ads are served by them till now. But now onwards you can have control over your ads it means now Advertiser manage their ads instead of infolinks. Now onwards advertise can have full control over their ads-like keyword selection, keywords bidding etc. I think this new launch may helpful for advertisers as well as their publishers too, because keyword selection may helpful in placing ads in proper place and this proper ads can helpful in publishers can get good CTR and they can increase their earnings. Anyway, this is new launch we have to sit and wait to see how it will work for advertisers as well as publishers. 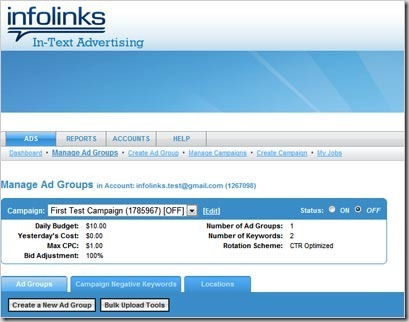 By this new self-service In-Text ad marketplace infolinks once again going to gain the In-Text ad marketplace. For start using this self-service In-Text ad marketplace advertiser have to pay minimum $5 per day. Below are the few key features which comes with Infolinks self-service In-Text ad marketplace. Fast ROI – sign up and see your ads deliver clicks in minutes! Simple payment – all payment methods welcome. We are proud to announce the official launch of our self-service In-Text ads Marketplace that will revolutionize how our advertisers create and manage Infolinks Ad campaigns. This is the first Self-Serving In-Text Ads Marketplace in the Word and it will allow large and small advertisers alike, to quickly and easily create targeted In-Text Advertising campaigns in a matter of minutes for a fraction of the cost of other platforms. The significance of this new ad management platform is far reaching. This Marketplace will offer the same ease and convenience of creating campaigns as Google AdWords, while giving the option to select the keywords most relevant for branding. The function of keyword bidding helps advertisers segment their market based on geography while offering further advanced optimization to allow full customization. The reporting is in Real-Time which gives advertisers the freedom to monitor and readjust campaign variables to boost brand lift. Advertisers can use infolinks marketplace by visiting this page. Infolinks is one of the best in-text advertising network. Excellent article about infolinks Arun Kumar.